Please allow me to introduce you to my current best friend. 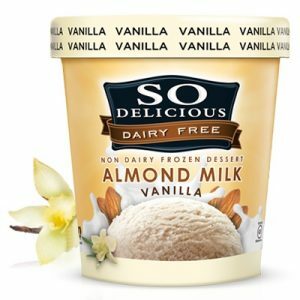 Yes, I’m a bit fickle … next week I might be onto a new BFF, but this week I’m adoring almond milk ice cream from So Delicious Dairy Free. Though the So Delicious Almond Milk Ice Cream flavors are definitely creamy and frozen, these are so much lighter than your average ice cream. I would label them as ice milks, but they also didn’t have any of those annoying ice crystals … just a smooth, dreamy texture. Even so, they were almost refreshing and didn’t weigh the least bit heavy on my stomach. Not surprising, since each serving only has about 4 grams of fat. But what I liked most was the low sugar profile. 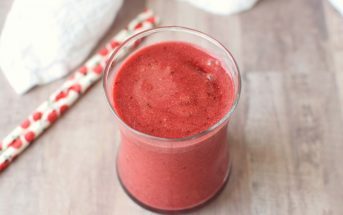 They use a combination of organic tapioca syrup, organic cane syrup, and erythritol (a sugar alcohol) to sweeten these bad boys, for a net sugar load of just 6 or 7 grams per serving. Though I wouldn’t venture to call this a health food, it is still a treat, these So Delicious almond milk ice creams were enjoyable to savor without the post-indulgence crash or continued sugar cravings. I don’t know about you, but typically when I eat sugary goodies, I’m left craving even more sweet treats! A vicious cycle indeed. But one that was broken, for me, with this dessert. As for the flavor, I think they are particular. The first couple of pints of this almond milk ice cream didn’t grab my taste buds. Though I’m sure many others would really like the Chocolate and Mocha Almond Fudge! But when I hit the Butter Pecan, WOWSERS, I was in love. 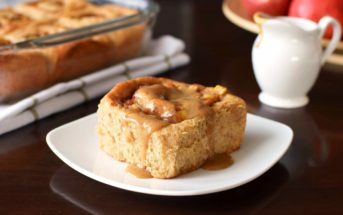 Rich, buttery, and deliciously sweet, this is a flavor that I enjoy when my praline cravings strike (yes, it happens). I really enjoyed this flavor. The ice cream base had a fresh, lightly cherry flavor, and there were huge chunks of sweetened cherries throughout. Maraschino fans will be in heaven. Though it is certainly unique in flavor, I found the Vanilla almond milk ice cream to be somewhat addictive. Even with detectable notes of the low sugar sweeteners. It has become my go-to, all-around ice cream, making its way into my shopping cart with quite regularly. I would hesitate on feeding this frozen dessert to dairy-free newbies or dairy-eating guests, but really like it for my own private stash. After trialing the coconut milk-based gluten-free Cookies ‘n Cream ice cream (also from So Delicious), I was surprised by how much sweeter and more intensely chocolate the Gluten-Free Cookies ‘n Cream almond milk ice cream was. 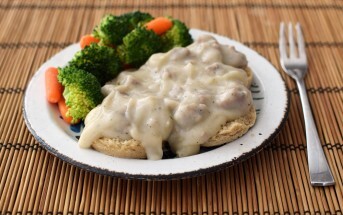 It has a very rich sandwich cookie flavor – frosting and all! There is just a slight erythritol and monk fruit taste in this variety, but the bolder, more dessert-like flavors really assert themselves. 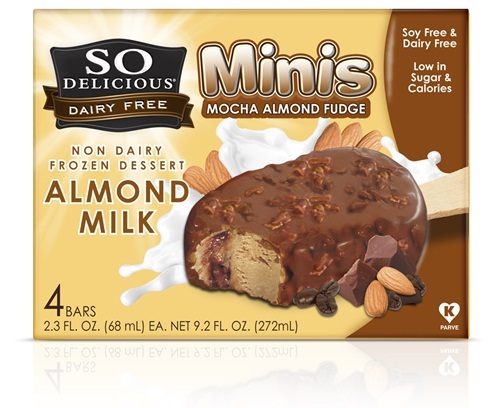 The So Delicious Almond Milk Non-Dairy Frozen Dessert Line also includes two varieites of Chocolate-Covered Ice Cream Bar Minis. I didn’t find them to be very “mini,” but rather the perfect size for a hot afternoon treat. I also thought that the chocolate used for dipping the bars was delightful. These are available in Vanilla and Mocha Almond Fudge (with nut-studded chocolate) varieties. 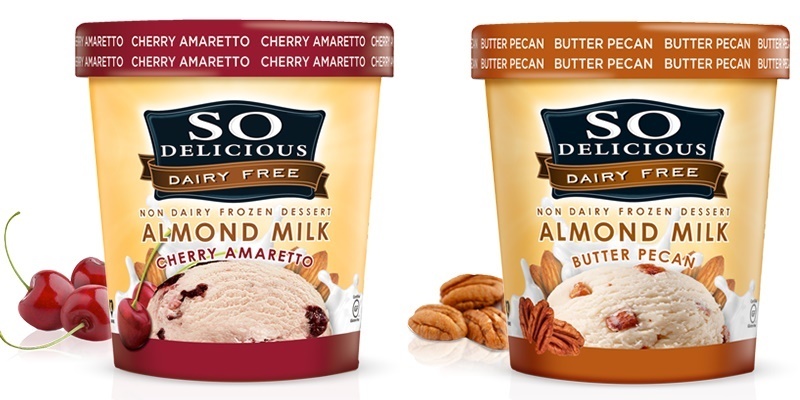 Certifications: So Delicious Dairy Free Almond Milk Ice Cream is Certified Gluten-Free, Vegan, and Kosher Parve, and Non-GMO Verified. 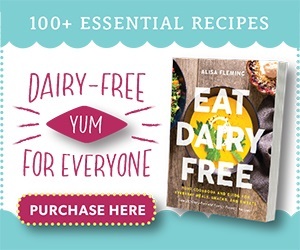 Dietary Notes: By ingredients, these almond milk ice cream pints are dairy-free / non-dairy, egg-free, gluten-free, grain-free, peanut-free, soy-free, vegan, and vegetarian. 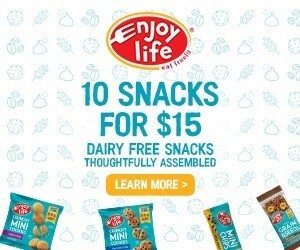 Nonetheless, read the ingredient statement and check with the company on their manufacturing processes for all varieties if potential allergen cross-contamination is an issue for you. Processes and labeling are subject to change at any time for any company / product. Though they are definitely creamy and frozen, these dairy-free pints are so much lighter (low in fat and sugar) than your average ice cream. The underlying flavor is unique, and not for everyone, yet I somehow found it rather addictive. What a bummer – that is a great one! 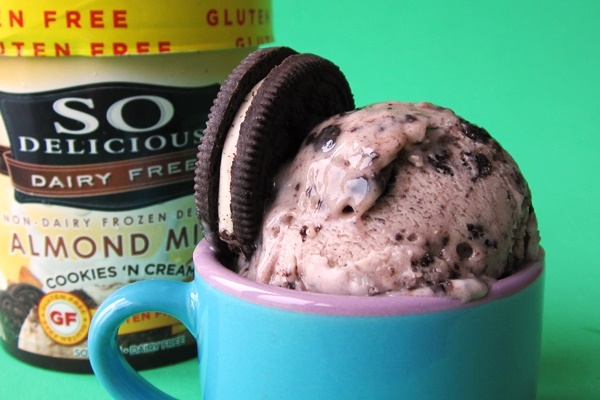 I am wondering if anyone has tried the Soy Milk “SO DELCIOUS” ice cream options? I love Soy Milk but I am unsure if the ice cream is any good. 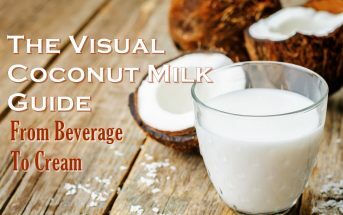 Also do you prefer the Almond Milk options or the Coconut Milk Options? I would love to hear any thoughts! I think the soy ones are really good! Here is my review of the pints (their packaging has changed – now “So Delicious” – but it’s still the same product inside). Soy just isn’t as “in” right now, but I still really like the soy-based ones, a little better than the coconut ones. The cashew ice cream is tops though in my opinion. I haven’t tried the other ones, but I have to very strongly second the caution about the flavor of the cookies ‘n cream. It’s not a slight fake sugar taste, it’s a strong fake sugar taste. I’m sure the other flavors are better, and I’d try them first. Thanks for sharing your thoughts on this Liz! It’s definitely a notable taste – I do think the Butter Pecan melded better with that sugar alcohol / monk fruit sharpness. But as mentioned, I do think they are particular. Why until now no dairy-free mint chocolate ice cream in Zehrs, sorry but I asked the sales lady, she said I dont know.. and thank you . You would need to contact the company direction or check the store locator on their website Emma! I tried the Cookies ‘N Cream flavor recently and found it to be light, creamy, sweet. and delicious. For a “healthier” ice cream, it’s one of the best I’ve tried! I live in el Paso, where can I fin your products..? May be in WalMart..? ?